Kids go to a rave and not all of them make it home the next day. I just finished watching this movie and I've never seen anything worse than this. I mean, this is a movie about the rave scene, and all we get to see is drive-by shootings, people being kicked and riots... The rave scene is not like it's being portrayed here. 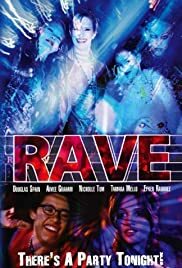 I guess the producers of this film are trying to get people NOT going to raves or might have had bad experiences of raves. Yes, there are drugs on raves and there are no defences against it. Not that that's what raves are all about. Raves are about coming together, having fun, feeling like you're part of something big and to become one with the music. It's all about love and that's the least I saw here. I saw racism, hatred and disrespect. I think the producers of this move did a great job for me not trying to convince my friends to see this movie. And believe me, I won't.